Exceptional. It's what you do. What we’ve learned from behavioural studies and behavioural economics is that decision making is not always a rational process – shocking, I know. While that might sound ridiculously obvious, the extent to which decision making is swindled by external and internal influences remains underestimated, and it continues to mislead people in their daily decision making. We all have two inherent decision making processes that are constantly at ends with each other. Kahneman explains that the first part is an automatic response associated with fast decision making: good for survival, but it also prompts immediate gratification which is usually irrational and short-sighted. The second part is a slower, more logical, form of decision making that is more rational. 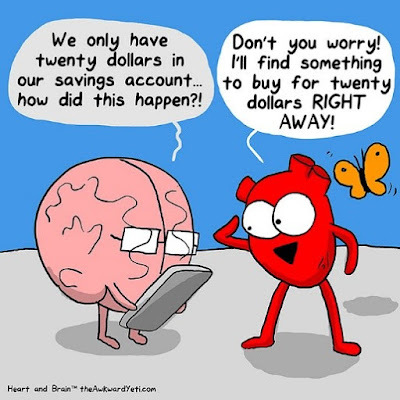 The decision making techniques applied to the present (“today”) competes with the more calculating part of the brain that is dominant during longer term decision making processes. This contradiction causes a time inconsistency in decision making. In short, it explains the reason for all those failed good intentions we know so well: “I will only stay for one drink”. Immediate gratification is a real threat to rational decision making. Another little obstacle we face is that we like to believe that we are quite objective and good intuitive statisticians. The fact that this isn’t true is a bitter pills to swallow. We unconsciously apply biases and heuristics to situations that taint our decision making. The point I’m trying to make? The contexts in which individuals can make decisions becomes important when you want to understand the complexity of behaviour in organisations. We need to be aware of the flaws in our own thought processing so that we can improve our own decision making and that of the groups and organisations we function in. We use initial information as an anchor for opinions. We then adjust subsequent opinions according to additional information received, however, subsequent opinions always land closer to the anchor than it would have had there been no anchor. Ouch! Basically our brains convince us that “if you can think of it, it must be important”. The ease with which we can recall information forms our opinion on the importance thereof. Ease of recollection is increased by the frequency of information or the salience of the event... if the Kardashians are on every magazine, surely they should be important right? We generally align our actions to conform to the perceived code of conduct of the environment we find ourselves in. Behavioural decision theories are extremely powerful when applied in an intentional manner in our own lives, in creating a group culture, or to team decision making. Creating organisational cultural norms can encourage individuals to make value adding decision that are in line with organisational objectives and values. Estée is part of our Behavioural Specialist team here at Workpoints. She is our keen researcher, our problem-solver and our number one sports star. Workpoints is a fully featured reward, recognition and incentives platform that provides you with the tools to create a high performance organisation. Our easy-to-use application integrates simply into any organisation and instantly encourages staff to do the daily grind with excellence and energy. Visit www.workpoints.co.za for more info and a free trial! Duflo, E. & Banerjee, A. (2012). Poor Economics. United Kingdom: Penguin Books Ltd.
Kahneman, Daniel, 1934-. (2011). Thinking, fast and slow. New York: Farrar, Straus and Giroux. How to help your team manage their personal finances? Workpoints Voucher Store - New Partners! Eat, Sleep, Work, Repeat. There’s MORE to life. New Feature Release: Notifications...Announcements made easy! Employee Engagement: Don't Up Staff, Up Your Staff! Award to multiple people - together as one! 16 Personality Types? More than 25 Reward Types! Peer recognition goes further than you know! Is leadership really that important? Don't be afraid to make a mistake!